Now that you have a basic idea about planning applications (and I have something to point people at later; handy, that), I can tell you what I really wanted to tell you about when I started typing that recent entry. Because I live where I live, we have some overlapping entities dealing with planning applications that could affect us, so I check them all. They, of course, have jurisdictions that include far more than just my little local area, so I mostly skim past them, learning some of the more interesting place names as I go. Such would’ve been the case with this application had we not locally had such an uproar over a caravan site that made me wonder just what sort of caravan site was being proposed, and curious if the traveller caravan site proposed for Glossop had been relocated elsewhere in the National Park. This application is not as described by the Chair of planning Paul Ancell “a normal application, which will be dealt with as such.” This application is an ill considered attempt by an Authority to cover up its own past serial lack of due diligences, and then a further attempt to inflict the consequences of these actions on the community by way of mitigation of these maladministrations. This application at best should never have materialised at all, at worst it should have been called in and dealt with independently. This application by any stretch of the imagination cannot be described as a “normal application”, by any informed responsible person. I’m still learning my way around such things, but I believe that in England, them’s fightin’ words. Most things seem to be said in much more wooly language. Mind, as you’ll see, he has very good reasons for throwing down the gauntlet this way, but it is a very shocking opening paragraph. I can’t get all the documents – some of this is too old – but reading from what I can find, in 1998, planning permission was granted by the Peak District National Park Authority for a caravan site on this field. Except the planner accidentally left out the word “touring” from the notice granting permission, thereby leaving open the possibility of static caravans. Aha. Caravans seem to be the pull-behind trailers; motorhomes seem to be RVs; static caravans seem to be the mobile homes or manufactured homes that stay put. I’m reliably told that static caravans come in quite a range of levels, from basic to luxurious, from small to quite sizeable (though always single-wide, and indeed all the ones listed on Glossop Caravans right now are 10 to 12 feet wide), and as such inherently suffer no connotation issues of “trailer trash” or the like. Indeed, I’m told it’s quite common to mix mobile homes (static caravans) into sites catering for people with RVs, etc, for people to rent while on vacation – or even to have sites exclusively made of the mobile homes (static caravans) for vacation goers (holiday makers). Well then, I don’t pretend to understand why the Peak District National Park is so opposed to static caravans being in the mix of this particular caravan park, but boy howdy, are they ever. Seems the developer that bought this piece of land with that permission already attached to it took them to court over it, and for some reason (I can’t find it), the High Court struck down whatever ruling was made, so the developer appealed to the Planning Inspectorate. Whenever a planning decision is made that the landowner doesn’t like, they can appeal to the appropriate federal government body, which is the Planning Inspectorate. In particular, it would mean that nobody could rely on the description of the proposed development given on either the application form or the planning decision notice, even if no other document was referred to at all, because there might just be another document submitted with the application that contained a different description. A further point is that a document such as the explanatory note may contain nothing that identifies it as an important document. For example, as in this case, it might not be on letter-headed paper. Although in this case it is a typewritten document on good paper, in another case, it might just as easily be a hand-written note on the proverbial back of a cigarette packet. I think it is inconceivable that a planning permission and a planning application, both absolutely clear on their faces, could be overridden by some other, possibly nondescript document that happened to be sent in with the application. How would anybody looking at the planning permission decision notice know whether such a document existed or not? The only answer would be that specific reference is made to that further document either on the application form or in the permission, or both. Without such reference, it cannot be incorporated into either the application or the permission. The Peak District National Park decided after this to buy the land back off the developer, at a massive loss. They put out a press release about how they “saved residents from developers”, glossing over why the developer got involved in the first place. Oh, and now they have access issues – the field isn’t immediately adjacent to the road, and they are now having trouble with the landowner of the bit the connecting road should go through. This issue hasn’t been cleared up yet, Mr Hardwick tells us. Brilliant! Even if it is, the turn will be on a blind bend – this was really well thought out, we can tell. Image from the National Trust. The park waited a few years, presumably hoping for residents’ memories to fade, and filed this application for this caravan site. 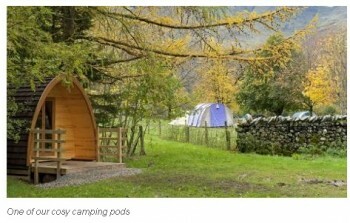 I think they’ve not included the static caravans, but they have included camping pods, which I had to look up. It’s a wooden hut which you’re to think of as a replacement for a tent – you’re meant to bring everything else. Only some are heated and lit. They cost as much to rent as a hotel or B&B. (We probably won’t bother with them.) 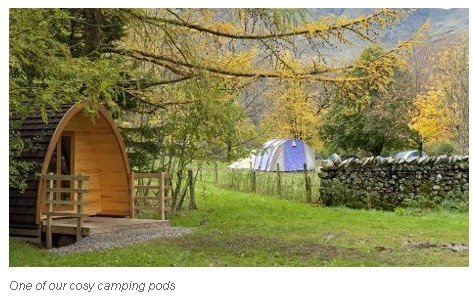 Now the residents are up in arms about the pods – I can see their point that these would be better suited for wooded areas than open fields. As it is, we can only shake our heads and know that at least there are incompetent fools everywhere. It’s one thing to have made the mistake and missed out the word “touring” in the original planning permission … but why compound the error by wasting so much money on the court case and the planning appeal, and then buying the plot of land? 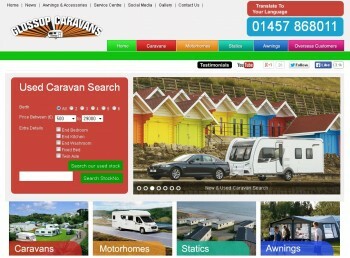 Truly, why is it so important that static caravans not be allowed? I don’t get it.